Olive oil is extremely healthy and is widely used for healthcare, skincare, and hair care purposes. It is prepared by pressing olives and extracting their oil, and it comes in many different forms. It offers an array of beauty uses. Other than using olive oil in a salad dressing or stir-fried dish, you can also add this ingredient to your beauty routine to take care of your skin, hair, and nails. In fact, this oil is used as an essential ingredient in a number of facial cleansing products, hair care products, soaps, body washes, and lotions. Here are 9 beauty uses of olive oil. Olive oil has moisturizing properties that help keep your skin soft, smooth, and moisturized. It easily penetrates deep into the skin and gives long-lasting results. 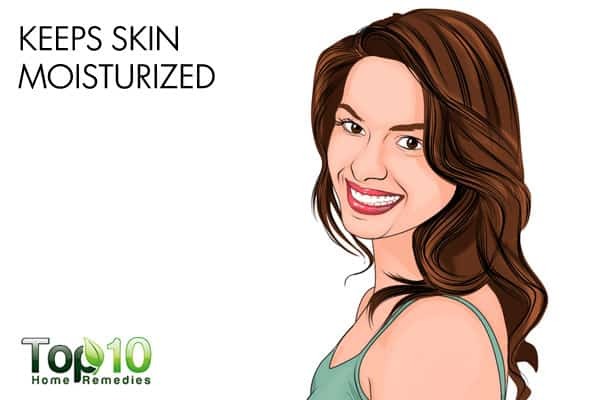 It is highly beneficial for those who have dry skin. Moreover, the natural lipids in olive oil contribute to sebum production. Sebum is the body’s natural lubricant. Also, olive oil can help repair damaged skin cells. Skin irritation and moisturizing tests in human subjects are suggested for further study. After taking a shower or a bath, lightly pat dry your skin. Use olive oil as a moisturizer and massage it into your skin while it is still slightly damp. Alternatively, apply olive oil all over your face, hands, and legs at bedtime to enjoy moisturized and supple skin in the morning. 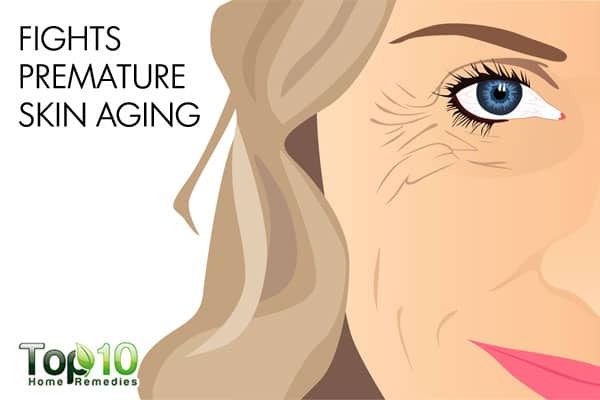 As you grow older, your skin begins to show signs of aging, such as wrinkles and fine lines. But with olive oil, you can keep these signs at bay. Vitamin E, a strong antioxidant present in olive oil, aids the regeneration of new skin cells that help keep the skin plump and moisturized. Also, it can tighten the skin to prevent the premature signs of aging. The monounsaturated fatty acids in olive oil rejuvenate your skin and keep it youthful. Add olive oil to your diet. You may use it for cooking or as a salad dressing. For daily treatment, gently massage some lukewarm olive oil on your face, neck, hands, and legs for at least 5 minutes. Do this every night before going to bed. Another option is put 2 tablespoons of organic raw honey, 1 tablespoon of olive oil, and ½ cup of ripe papaya pulp in a container. Mix well and apply it on your face. Let it sit for about 5 to 10 minutes, and then rinse the mixture off with warm water. Use this mask once or twice a week. 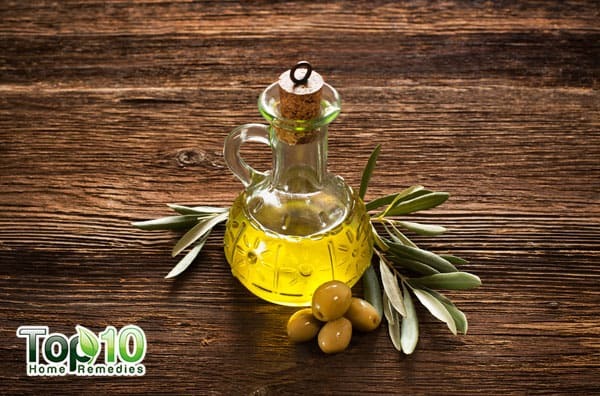 If your skin is sunburned, use olive oil as a treatment. This ingredient can help heal even severe sunburns. The soothing and moisturizing nature of olive oil helps reduce inflammation and revitalizes the skin. 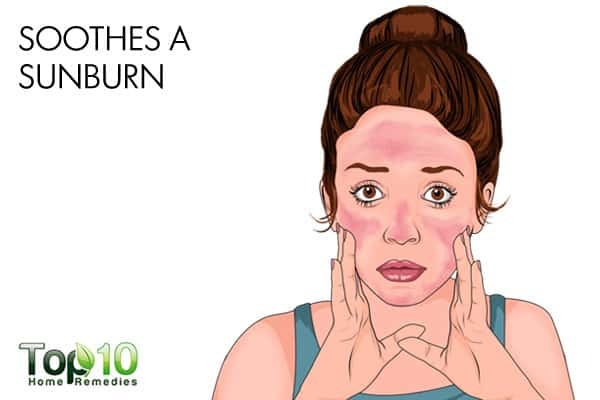 It also prevents skin peeling, a common symptom of sunburn. Simply rub some olive oil on the sunburned area and leave it on for a few hours. Rinse it off with cool water. Do this a few times daily for several days to promote healing. You can also add some olive oil to a warm bath and soak your body in it for at least 30 minutes. Do this once daily. 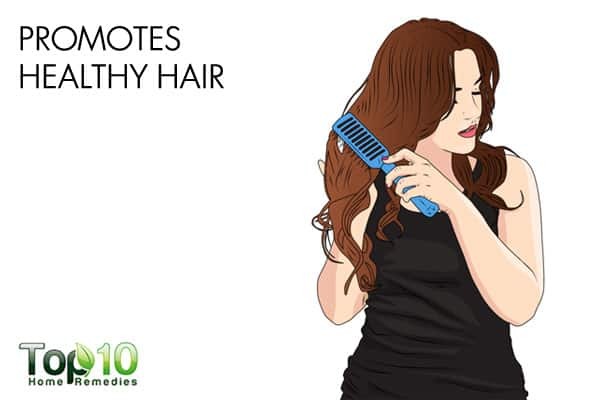 Its moisturizing nature promotes healthy hair growth. Also, olive oil penetrates deep into the hair shafts and softens the scalp tissue to treat scalp inflammation. 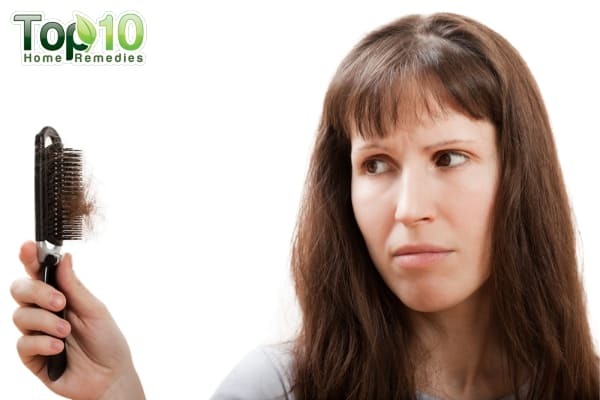 Massage some lukewarm olive oil into your scalp (in a circular motion) for about 5 to 10 minutes. The next morning, shampoo your hair as usual. Olive oil also nourishes the tender skin around your eyes and softens fine lines. Gently dab some olive oil under your eyes and massage gently for a few minutes before going to bed. The next morning, wash the area with water. Repeat once daily. 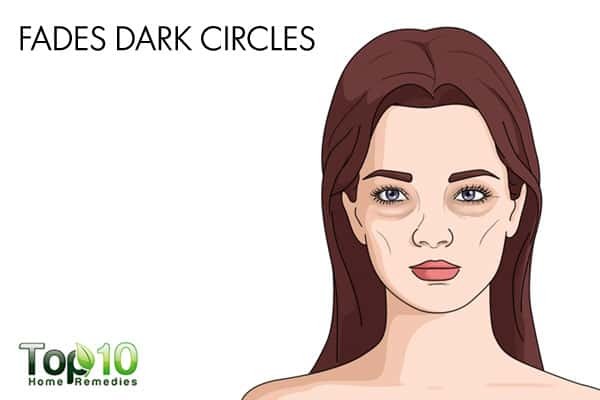 Another option is to mix equal amounts of olive oil and lemon juice and apply the mixture on the dark circles around your eyes. Leave it on for 10 minutes, and then wash your face with lukewarm water. Do this 1 or 2 times a day. Cracked, rough heels need moisture to heal. With its strong moisturizing properties(7), olive oil is the perfect solution to this problem. For best results, use olive oil before going to bed. This will give the oil ample time to fully penetrate your skin. Soak your feet in soapy water for 10 minutes. Scrub your feet gently with a pumice stone. Rinse your feet with water and dry them thoroughly. Apply a generous amount of olive oil on your heels and soles. Put on a pair of clean socks and go to bed. Repeat this daily for a few days until the cracks in your heels are healed completely. 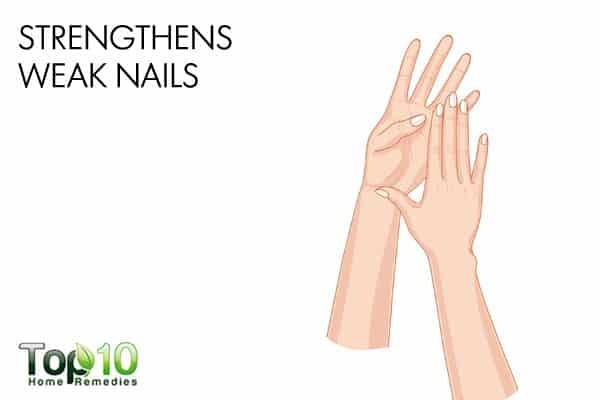 Olive oil is also a good remedy for weak and brittle nails because of its vitamin E content. (6) Its moisturizing property helps repair damage and softens your nails and cuticles to keep your nails healthy and strong. Olive oil can also prevent hangnails, the small bits of skin that hangs off the cuticles and can cause a lot of pain and discomfort. Before going to bed, massage a few drops of warm olive oil into your nails for a few minutes. Slip on cotton gloves, and then go to sleep. Repeat this beauty remedy daily. Olive oil is very effective in treating chapped and dry lips due to its vitamin E content. (6) It also works as a lip moisturizer to make your lips smooth, soft, and supple. This ingredient also lightens dark lips and makes them lustrous. Combine coarse sugar with 1 teaspoon of olive oil. If you want, add a little lemon juice to the mixture. Use the mixture to gently scrub your lips. Rinse your lips with lukewarm water, pat dry gently and apply little olive oil. Do this a few times a week. 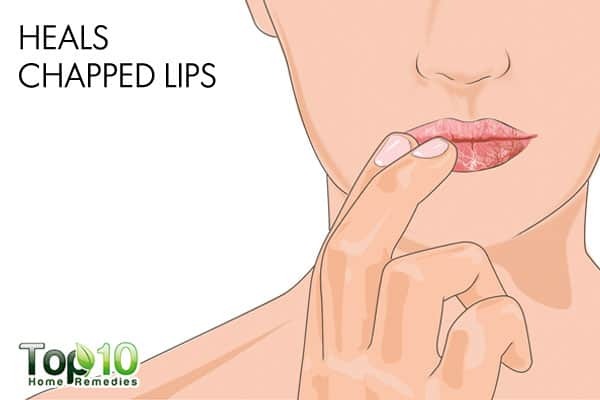 You can also apply olive oil directly on your lips daily before going to bed to keep them from becoming dry or chapped. If you have a bottle of olive oil in your house, you don’t need to buy a commercial makeup remover. 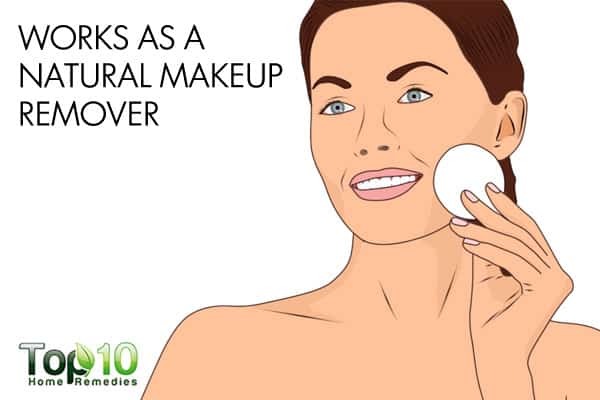 Extra-virgin olive oil works as an effective natural makeup remover. 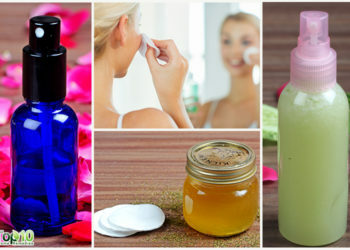 The oil helps grab onto and wipe off other oil-based products that you may have applied on your face, making it a great natural remedy to remove makeup. It can even help you get rid of waterproof makeup, which is very hard to remove. Plus, it helps keep your skin well moisturized. To wipe off light makeup, put a little olive oil on a cotton ball. Use this to remove the makeup from your face. Then, wash your face. To remove heavy makeup, apply a few drops of extra-virgin olive oil all over your face. Massage it around your face and leave it on for some time. Follow up by wiping your face thoroughly with a washcloth soaked with lukewarm water. When it comes to olive oil, choose a high-quality product that doesn’t contain additives or chemicals. Do not use olive oil for beauty purposes if you have sensitive skin or oily skin or if you suffer from skin conditions like dermatitis. Avoid exposing the olive oil to excessive heat, light, or oxygen. Don’t forget to add olive oil to your diet, as beauty starts from within! Olive oil and skin. International Olive Council. http://www.internationaloliveoil.org/estaticos/view/98-olive-oil-and-skin. Chaiyana W, Leelapornpisid P, Phongpradis R, Kiattisin K. Enhancement of antioxidant and skin moisturizing effects of olive oil by incorporation into microemulsions. Nanomaterials and Nanotechnology. https://journals.sagepub.com/doi/abs/10.1177/1847980416669488. Published October 10, 2016. Latreille J, Kesse-Guyot E, Malvy D, et al. 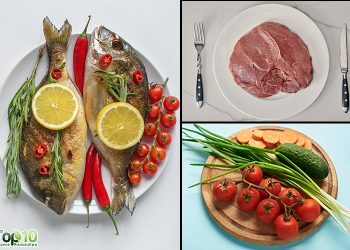 Dietary Monounsaturated Fatty Acids Intake and Risk of Skin Photoaging. PLOS ONE. https://www.ncbi.nlm.nih.gov/pmc/articles/PMC3435270/. Published September 6, 2012. Korać RR, Khambholja KM. Potential of herbs in skin protection from ultraviolet radiation Pharmacognosy Review. https://www.ncbi.nlm.nih.gov/pmc/articles/PMC3263051/. Published 2011. Hashmi MA, Khan A, Hanif M, Farooq U, Perveen S. Traditional Uses, Phytochemistry, and Pharmacology of Olea Europaea(Olive) Evidence-based Complementary and Alternative Medicine. https://www.ncbi.nlm.nih.gov/pmc/articles/PMC4352757/. Published February 23, 2015. Keen MA, Hassan I. Vitamin E in dermatology – PubMed Central (PMC). 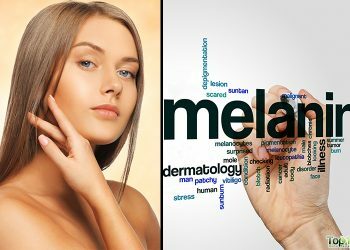 Indian Dermatology Online Journal. 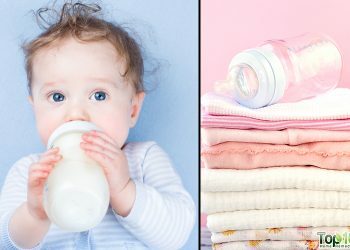 https://www.ncbi.nlm.nih.gov/pmc/articles/PMC4976416/. Published 2016. Lin T-K, Zhong L, Santiago JL. Anti-Inflammatory and Skin Barrier Repair Effects of Topical Application of Some Plant Oils. International Journal of Molecular Sciences. http://www.mdpi.com/1422-0067/19/1/70. Published December 27, 2017.